WWWhack is a brute force utility that will try to crack web sites guarded by a web access password, here you can find the wwwhack hacking software free download. This utility can use a word file or try all possible combinations, and by trial-and-error, will attempt to find a combination of username/password that is accepted by the web server. This shows the weakness in securing sensitive areas of your web site by the web authentication method alone. 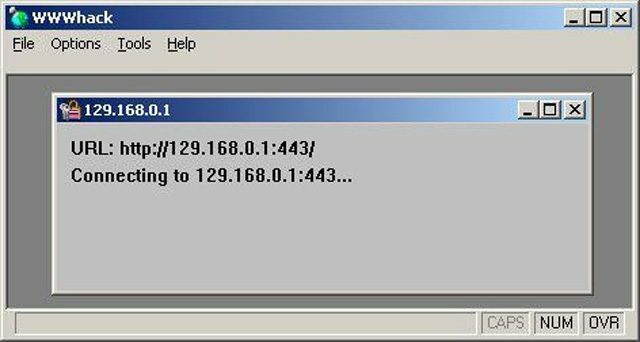 To use wwwhack 1.9 you need to set your system clock to the year 2000 or before as it expires in ‘2001’. Once again this is an oldskool tool but a lot of people are still seeking it, for learning purposes I presume as there are better alternatives now like THC-hydra. You can download wwwhack 1.9 here. To avoid any network issues the zip file is passworded, the password is darknet123. Your anti-virus software may find a Win32.Hacktool or similar in this file, that’s normal for most hacking software. Darknet in no way implies that this software is safe and free of malware, use at your own risk. It seems the recent fake login flaw effects both Internet Exploder and Firefox. Good to keep alert and with the new update mechanism it’s very simple to update your Firefox installation. The latest versions of both Firefox and Internet Explorer are vulnerable to an unpatched flaw that allows hackers to snaffle users’ login credentials via automated phishing attacks. The information disclosure bug affects the password manager in Firefox 2.0 and its equivalent in IE7. Firefox’s Password Manager, for example, fails to properly check URLs before filling in saved user credentials into web forms. As a result, hackers might be able to swipe users credentials via malicious forms in the same domain, providing users have already filled out forms on this domain. Basically you just need to disable the feature that rememebrs the passwords, and it seems for once the vector is slightly more serious for Firefox users than for IE users. Samples of attacks utilising the flaw have already been reported on MySpace. Firefox 2.0 users might be more at risk from the flaw because IE7 does not automatically fill in saved information. Security notification firm Secunia advises users to disable the “remember passwords for sites” option in their browsers pending the delivery of patches. This so-called reverse cross-site request flaw was discovered by security researcher Robert Chapin, who explains the issue in greater depth in an advisory here. Reverse cross site scripting? The names are getting more and more complicated. GoldenEye is a brute-force hacking program and was written for web-masters to test the security of their own sites. This is an oldskool file, a lot of people are still looking for this. It should not be use by others to hack sites – this would be illegal! Under no circumstances should the author or any other persons involved in its development or distribution be held liable for the misuse of the program. Once again these old files and tutorials are meant for the purpose of learning, test them in your own lab, see how they work, see what they do then try and write something similar yourself. GoldenEye executes its attempts simultaneously. The number of simultaneous attempts can be adjusted with the speed slider on the “access” tab. You can also adjust the speed limit. On the Options|Connections tab you’ll find a box to set the “top-speed”; select an apropiate value. Use lower values for slow internet connection! If you get to much timed-out connections, lower the crack speed or increase the TTL (time to life). Timed-out connections will be automatically resumed if you check ‘Resume time-out connections automatically’ on the same tab. Note: The program is tested with 70 simultaneous request. If you choose a higher value, do it on your own risk! If GoldenEye tells you something about buffer problems, lower the speed next time. I’ve encountered that other running programs may cause buffer problems. GoldenEye logs the cracked sites. They are listed on the History|Access History tab. You can select and delete single entries or the whole list. Expired combinations will be automatically removed when you click the check for expired passwords button. Click on the ‘visit button’ or double click on the selected url to launch it in your browser. or you type in a part off the url or a defined site name (see History|URL History) and click on the small button at the right end of the url-box. Change proxy after x attempts: GoldenEye changes the proxy automatically after x attempts if this options is checked.You have to use several proxies to use this feature. Add proxies on the Options|connections tab.GoldenEye changes the proxy randomly or in the order which is given by the proxy-list. Server Response: the standard values are ‘200’ for ok and ‘401’ for access denied (unauthorized). If the server you’re attacking gives other reply numbers you can change them. Note: You can’t use 404 or 500! Cookie: If the attacked server needs a cookie, check this option and enter the cookie string. Referer: If the attacked server needs the url of the refering site, enter it here. Remove dupes: New: If you’re using single lists for userID and password GoldenEye removes the dupes simultaneous. Convert the list: All passes will be converted ‘on-the-fly’. Wordlist style: If you want to use single lists: check this option. “Common manipulations” are predefined manipulations. On the “Advanced” tab you can choose your own prefixes, suffixes, etc. If you miss something, tell me! Server security test: It tests the attacked server for other security holes. Proxy test: tests the proxy-speed. The values are in milliseconds. Your anti-virus software may find a Win32.Gen.Trojan or similar in this file, that’s normal for most hacking software. Darknet in no way implies that this software is safe and free of malware, use at your own risk. You can download GoldenEye 1.0 here. There seems to be have been some slight relaxation on the DMCA regulations lately, which is a good thing for the majority of people! There have been many grey cases and sadly most have fallen on the side of the big corporations, finally something on our side! The U.S. Copyright Office specified new rules Wednesday allowing cellphone owners to hack software designed to prevent them from using their phones on competing carriers. Retrogaming enthusiasts will also be permitted to crack copy protection on abandoned titles, albeit for “archival” purposes only. I think it’s perfectly reasonable, if I buy a peice of hardware or whatever I should completely own it and be able to use it for whatever I want, I shouldn’t be limited by the company that sold it to me. And thankfully a thumbs up for educators too. The rules also allow teachers to copy “snippets” from DVDs for educational compilations, and confer the right to have third-party software read copy-protected electronic books –if you’re blind. You can see the full list of 6 exemptions here. TXDNS 2.0.0 has been released. This new version features a distributed model which further boosts TXDNS’s parallelism and performance. This model allows a TXDNS client to send jobs to a TXDNS server over a clear or encrypted TCP channel. Using -cr instead of -c will force the TXDNS server to redirect all output to the client, so basically you get the results from the server’s job right on the client console. Note that file system streams are not redirected, which means that any file switches (-f or -h) will still have the remote host as root reference. To encrypt all the traffic between the client and the server just append ‘–key ‘ to the regular syntax on both the client and server. A new –countdown option has been added as a very basic synchronization mechanism, and by default, any jobs, no matter remote or local will now delay for 5s before firing. If you want to bypass this countdown delay you’ll have to add ‘–countdown 0’. Grab the new Firefox now, 2.0.0.1! 8 Security Vulnerabilities have been fixed in this last release of the year 2006. I’m glad to see Firefox upholding their quick turnaround and rapid fixing of issues that spring up during development and improvement of their product. Mozilla has released the first update for the Firefox 2.0 browser to fix eight security vulnerabilities. Five of the eight flaws were rated as critical, according to Firefox. A critical rating means a Firefox user would be vulnerable to attack and remote software installation on their machines just from browsing the Web in the usual fashion. Two of the flaws were rated as high, while one received a low security-risk rating, Firefox said. Mozilla’s advisory and information on the update can be found on the company’s Web site. Danish security firm Secunia ApS also posted information about the patches on its Web site.